Hand-coloured etching entitled 'Nappy in Tow' created by Isaac Cruikshank and published by J. Williamson, London, 24th August 1803. 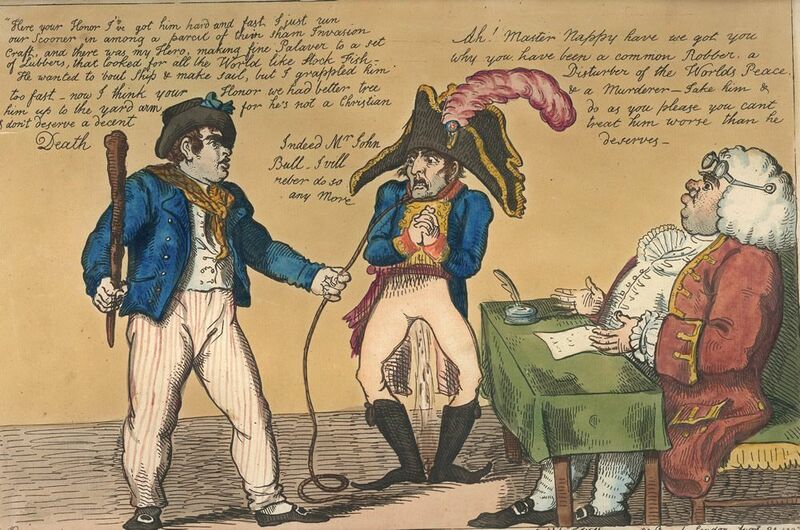 Shows Napoleon, wearing a huge bicorne hat, standing in the centre of the design cowering and terrified and held on a long rope halter by a stout, belligerent sailor, John Bull, who brandishes a cudgel and threatens to hang him from the yardarn of his schooner. Both stand before a country magistrate, who sits at a table pronouncing sentence upon the Emperor. A satire on British superiority at sea and the end of Napoleon's hopes of invading England. This Nappy in Tow Art Print is created using state of the art, industry leading Digital printers. The result - a stunning reproduction at an affordable price.